In the Song Library you will find a full version MP3 file of all the songs offered. Feel free to listen to or play along with any of the songs. If you hear a song you would like to learn, go to our Song Lessons and work with the videos. New songs will be added every month so you can continue to expand your repertoire. We hope you will visit our Song Library often. The classical guitar of Robert Swinton offers a refreshing alternative to traditional piano entertainment, and greatly enhances any occasion, from dinner parties to weddings to corporate functions. Your guests will enjoy a full range of classical compositions, including selections from Bach, Beethoven, Tchaikovsky and Mozart, and such Spanish composers as Carcassi, Carulli, Giulini and Fernando Sor. Robert’s repertoire also features pieces arranged by Andrés Segovia, and several flamenco guitar selections, including "Malaguena". "I’ve always enjoyed the pleasing tones of the classical guitar. As a boy, I listened to records of Andrés Segovia, and was fortunate enough to hear him perform live. Now I’m honored to have the opportunity to share this soothing, beautiful music with you." There’s nothing that gets a party started like the familiar folk, country and island selections in the acoustic repertoire of Robert Swinton. 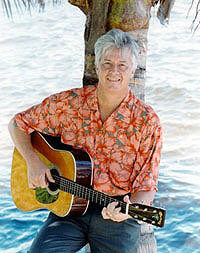 Sing along with such favorites as Jimmy Buffett’s "Margaritaville" and James Taylor’s "Fire and Rain". Take a trip back in time with selections from Cat Stevens, Dan Fogelberg and Arlo Guthrie - or go a little bit country with songs from Garth Brooks and Hank Williams. Finish off with the Caribbean calypso flavor of "Jamaica Farewell", an old island favorite by Harry Belafonte. Designed for light and relaxed venues such as small clubs and pool parties, this eclectic music mix is always a real crowd pleaser. "My acoustic selections showcase a wide variety of yesterday and today’s performers - from Jimmy Buffett to Harry Belafonte to Garth Brooks. Whatever your style of music, you’ll find plenty of selections that you and your guests will love. I guarantee, we’ll have a lot of fun!" GtrTeacher.com gives you the experience of music lessons and one-on-one training in our virtual classroom. You will have your own instructor and you can take your lessons at any time that works best for you. You can communicate with your instructor easily using our messaging system or have a video conference, available by appointment. You will recieve step by step instruction to help you learn to play the guitar with custom lessons sent directly to you. You receive text and email practice reminders as well as notifications of new lessons and any messages from your teacher. There are looping and slow-mo features on the video lessons plus multimedia learning tools. Tuition cost for Virtual Guitar Lessons is $65 charged monthly, half the cost of private lessons. An eight-week lesson package designed to provide beginning students with a comprehensive introduction to the instrument. Includes a ½-hour lesson once a week for eight weeks, at a total tuition cost of $190/student. Options for more than one student per session are available. Lessons provided for either classical or acoustic guitar. Scheduled by appointment. Appropriate for ages 7 years and up. Offered for beginners through intermediate students. Students learn proper playing techniques and how to read music and chord charts, while gaining a working knowledge of the guitar. Weekly ½-hour lessons are scheduled by appointment, at a tuition cost of $120.00 for four lessons. Available for both classical and acoustic guitars. Appropriate for ages 7 years and up. This comprehensive one-on-one learning experience includes one ½-hour lesson plus four ½-hour rehearsal sessions each week for $125/week. Students from beginners through intermediate will learn, practice and master proper playing techniques under the direct supervision of Robert Swinton. Available for both classical and acoustic guitars. Appropriate for ages 7 years and up. To schedule lessons, visit the Contact Me section of this site. I invite you to come out and enjoy my performance's in person. Come out and enjoy the tropical breezes of South Florida!